This photograph of our brother Andy was probably taken when he was six or seven. Lacrosse was and is very popular among the Mohawks. 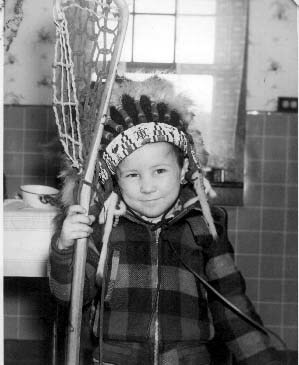 I remember going to Canada with Dad and Andy to buy lacrosse sticks. Andy had a scar below his lower lip which was the result of one of our backyard lacrosse games in Hemlock.